Kneeling is an integral part of the worship in many churches across North America. Waggoners provides a variety of products to meet the needs of our more liturgical denominations. Waggoners can provide the finest in aluminum frame kneelers. These come with metal epoxy finish, new vinyl covered pad and silent motion hinges. Install them yourself or have our team do it for you. Many kneelers are showing signs of worn fabrics or deteriorating foam. The best solution is a replacement pad by Waggoners custom-made to your desired lengths. Available in quality vinyl, naugahyde, velvet or olefin. These board based cushions come with 2-3 inches of extra dense kneeling foam. They have a non-skid base or can be permanently affixed. This avoids the potential for sliding of reversible rail cushions. 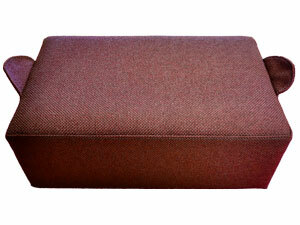 A wood box base with 2-inches of foam makes for a heavy durable individual kneeler. Our hassocks come in the two most popular sizes of 18x6x6 and 15x9x6. Quality naguahyde replicates this popular oval look in a hassock. With tabs for ease of movement, they come in a variety of colors. Typically produced on a 15×9 oval on a heavy plywood base with 5-1/2 inches of a special blend of foam. We can make the look you want using finer fabrics, leather or with custom foams. Longer hassocks and special styles are possible. So, provide us with your specifications and see what we can do! 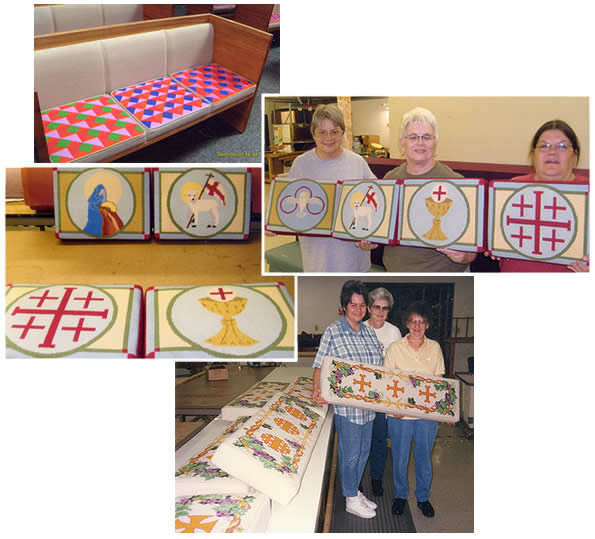 Waggoners can take your (blocked) needlepoint tops and mount them on a quality foam base and matching fabric sides. We have satisfied customers from coast to coast. If you have existing needlepoint, we can arrange for picking up your cushions, professionally cleaning the tops and then remounting them on new foam with a new base.